We pride ourselves on having a friendly, approachable team of qualified repair professionals that have a huge passion for vehicle repair and standards, and continually aim to deliver an exceptional service to our customers. As vehicle technology continues to progress it is imperative that our staff are trained in the latest manufacturer processes and innovations. Our technicians and staff receive regular training by the manufacturer, allowing them to competently repair your vehicle to the highest possible standards. Many of our Technicians have achieved the ATA, Automotive Technician Accreditation, ensuring that they have the necessary skills and competencies in all areas of Vehicle Damage Assessment, Panel repair and replacement, and Paint Refinishing. 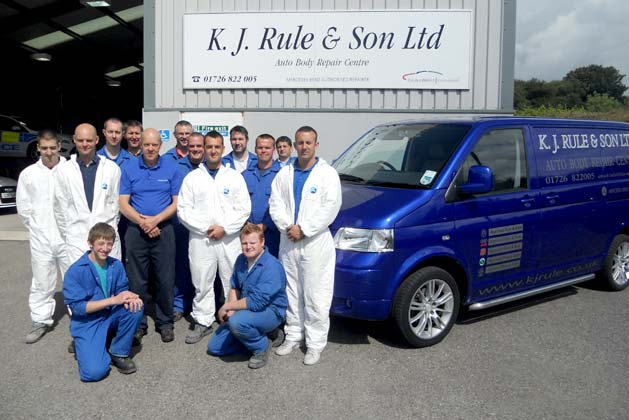 Established in 1977, KJ Rule & Son Ltd is an independent, family run, vehicle accident repair centre located in Cornwall in the South West of England. We specialise in manufacturer approved vehicle body repairs and work alongside leading brands such as Mercedes Benz, Audi, Volkswagen and Volvo.